Microsoft Windows 8.1: Users “Force” To switch From 8.0 To Windows 8.1: Microsoft really likes those users who have a computer with Windows 8 , so that is making every effort and some for free upgrade to the new version 8.1 , which officially Launched. Certainly , Windows 8.1 , whose pre-sale has already started , will come with a host of improvements and new features compared to the current version , which was launched in 2012 . 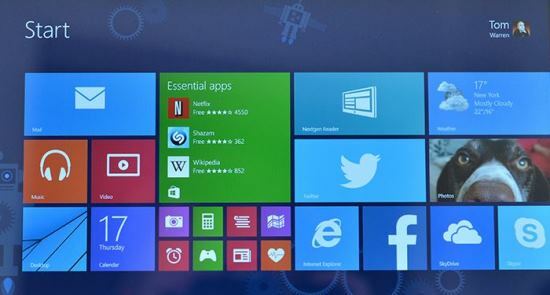 Windows 8.1 brings new colors and options of wallpaper for the home screen . Now your lock screen will turn a slide show of your favorite photos , in addition there will be a feature that will allow the user to take pictures with the camera on your computer or tablet straight from the lock screen without necessarily logging. The new home screen will now support four dynamic block sizes , including new large and small, so the user can customize the home screen and leave with your face. Clicking the new button start , according to Microsoft itself can either open the home screen , as in the old way , as in Windows 7. As the current version of Windows you can adjust the applications side by side only of new shapes and sizes , now you can adjust the applications of any size you want , also can use up to 3 applications simultaneously dividing your screen . Another new feature of Windows 8.1 is that you can keep two windows of the same application set next to each other at the same time. The new version of windows will also update with native applications , have gained new features and new interface , Microsoft will also launch new applications that have not been revealed , nor officially presented . Finally another major innovations in the field of software is Internet Explorer 11 , which promises a faster Web browser and support for some standards such as WebGL . There are other less noticeable changes , such as a virtual keyboard improved ( more suitable for tablets ) . The camera software has also undergone some improvements , among which a new panorama mode that (similar to Android and more recently iOS ) lets you take photos in rich detail through 180 . If you already have installed Windows 8 on your computer , you will have access to briefly update totally free of charge via the Windows Store . If you have a tablet with Windows RT , which will be dependent on the timing that the manufacturer will release a new update . This means that the Windows 8 support at least the version that Microsoft released a year ago , officially ends 18 October 2015 . If you decide to upgrade to Windows 8.1 , Microsoft will continue to support the life cycle of the operating system / operating until at least January 10, 2023 . So if you saw no apparent reason to make the change in your operating system / operating , here’s a good reason , not to mention the constant warnings from the company , in which the Windows XP support ends April 8, 2014 and Windows 7 to complete the January 13, 2015 .